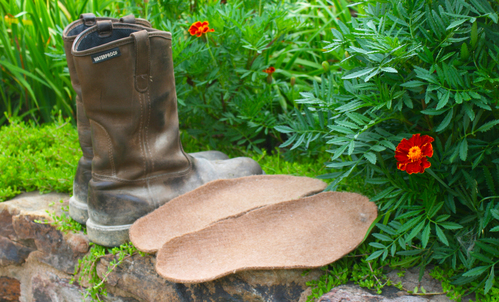 Check out our felted insoles for sale in your own farm store! In great shape after months of wear! Great all year in the barn shoes! 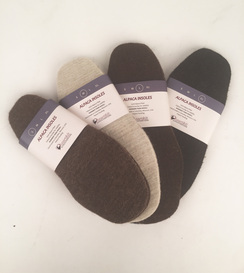 You can purchase insoles made from our fiber, or we can prepare custom batches of insoles under your own label from your alpaca fiber. 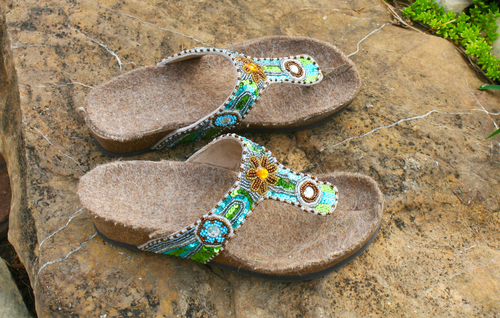 The minimum order for a custom batch is 25 pounds of fiber, which translates to roughly 200 pairs of insoles. We have done the math, and you can net at least $30 per pound by sending us your fiber as batting and then selling the insoles we make from it. Pretty good use for coarser blanket fiber—contact us if you’d like to know more about how we calculated this. Contact us at info@heartfeltalpaca.com or by phone at 573-445-4233 to place your wholesale order. We can accept checks, Paypal, or credit cards. Sizes include Small (women’s shoe sizes 5-7), Medium (women’s shoe sizes 8-10 ), Large (men’s shoe sizes 8-10), and Extra Large (men’s shoe sizes 11-13). 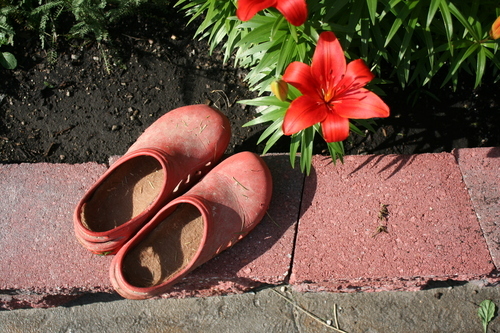 We would love to work with you to warm hearts and “soles” across the country! Heartfelt LLC is a creative partnership that designs and makes felted alpaca products featuring rugs and decorative wall art. The seed of the Heartfelt idea was sown several years ago when a handful of mid-Missouri alpaca breeders formed a cooperative outlet for their alpaca products. That early effort matured when the four Heartfelt partners acquired a FeltLoom™ in 2010. Heartfelt is truly an American business. The FeltLoom™ was invented and is manufactured by an alpaca breeder from Kentucky. The fiber used in Heartfelt products is produced in mid-Missouri. The mill that processes the fiber into batting is in Michigan. And the final products are produced by the Heartfelt partners themselves in Columbia, Missouri.